In early January a progressive wave overtook the California Democratic Party's delegate election. For a peek into how and why it was so successful, watch the first video at left, which was widely shared in social media at the time. Not only does the video quickly and succinctly explain the situation, but their website (www.ADEMS2017.vote) was masterfully well designed. The site made it easy to identify your own district by zip code, where to vote and when, and who were the progressive candidates. As the second video shows, the rest was history... History In The Making. For the first time ever, the CA ADEM election was an actual exercise in real democracy, instead of a comparatively secretive meeting of party insiders. Cowabunga! TRANSLATION: Past ADEM elections were secretive affairs unknown to 99% of California's registered Democrats. By keeping the elections so quiet, participation was limited to lobbyists and inner-circle loyalists. In 2017, those gosh-darn pesky Progressives opened the door and shed light on the process... which resulted in inner-circle party loyalists being "deprived" of their "rightful" seats. Progressives are putting "democracy" back into the Democratic Party. The third video calls out the mainstream media for the establishment corporate lackeys that they are. Jane Sanders chides the media for their failure to even mention the California ADEM revolution. However much the corporate media desperately tried to ignore it, you may be sure that DNC officials were talking about it, albeit in private. Visit this website's Justice Democrats page for amusing MORNING JOE clip of Howard Dean alluding to the CA ADEM election (without mentioning it by name). The professionally produced video at right may not live up to the production standards of the videos above, but it does contain some useful information about the party structure here in California. Per the DNC's own Bylaws, the vote was not supposed to be secret... And yet it would have remained secret, were it not for a week of persistent pestering by progressives. Finally, after being forced into it (by people who refused to stop nagging on behalf of DEMOCRACY, dammit...) the DNC reluctantly followed its own rules and made the vote public. The good news for Californians is that 2/3 of our representatives voted for progress (and winning in 2020), but about a third voted "Status Quo." The outcome of the vote nationally was a narrow win for the Establishment Choice, Perez, which is of course disappointing... The DNC Establishment couldn't even throw a bone to progressives (DNC Chair is a mostly symbolic position). 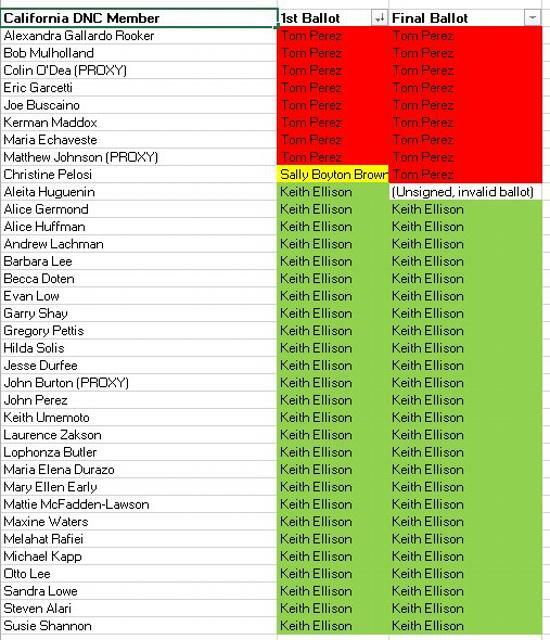 It is too early to tell how sincere Perez was in reaching out to progressives by appointing Ellison to a non-functional new position ("Deputy" Chair...? Echos of Festus in the old GUNSMOKE series...). Progressive Democrats will hope for the best, but if the party does not take a sharp turn to the left... the possibility of a win in 2020 recedes quickly over the horizon.